To prevent against burnout, hospital leadership should prioritize "latitude," or the ability for providers to use their best judgement when delivering care, according to an analysis published on athenaInsight. In a survey of more than 1,000 physicians on athenahealth's network, the company found clinicians were less likely to report symptoms of burnout when they have "latitude to work at the tops of their licenses." 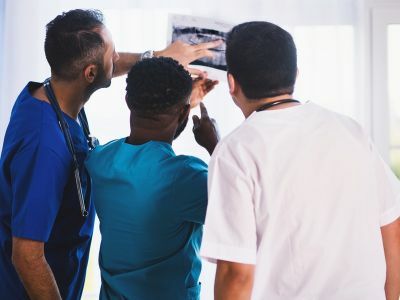 "Research from athenahealth shows that administrators would do well to trust their MDs — creating structures that loosen strict roles, enable optimal care delivery to flourish and restore joy to the practice of medicine," the analysis reads. 1. Autonomy against performance goals. "The more helpless physicians feel about their options for care delivery, the more likely they are to experience symptoms of burnout. The key is not to throw metrics out the window … instead, [it is] for a healthcare organization to align with its physicians' values and build an environment of personal respect." 2. Innovative clinical roles. "Providers thrive most when matched with patients and situations that truly challenge and compel them. This might mean a balance of simple and clinical cases; teaching or administrative opportunities; or involvement in new service lines," as well as allowing providers to specialize in the types of cases they find most fulfilling. 3. Team-based support as they care for patients. "While latitude is about individual freedom, clinical success seldom happens alone. The backing of a strong team liberates physicians to focus on care delivery," according to the analysis. For example, hospital leadership might hire ancillary staff to address shifting Medicare regulations or have staff consult physicians before scheduling their appointments. To access the analysis on athenaInsight, click here.